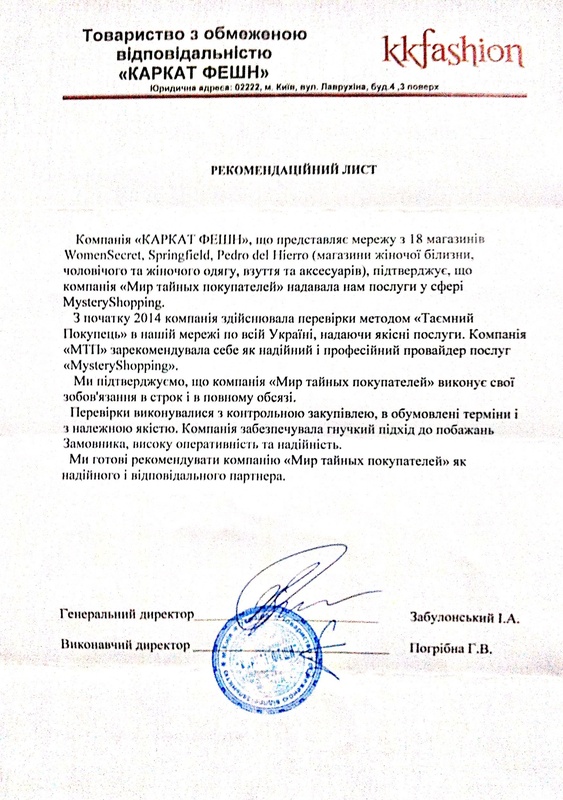 The company KARKAT FASHION, representing a network of 18 stores, such as WomenSecret, Sprinfield, Pedro del Hierro (ladies underwear, menswear and womenswear, shoes and accessories), confirms that the company Mir Taynykh Pokupateley provided us with the services in Mystery Shopping. Since the beginning of 2014 the company has been performing the inspections by «Mystery Shopper» method in our network throughout Ukraine, providing qualitative services. The company MTP approved itself as reliable and professional provider of Mystery Shopping services. 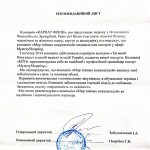 We confirm that the company Mir Taynykh Pokupateley performs its obligations in time and in full. The inspections were conducted with test purchase, within specified time-limits and in proper quality. The company provided flexible approach to Customer’s demands, high rapidness and reliability. We are ready to recommend the company Mir Taynykh Pokupateley as reliable and responsible partner.